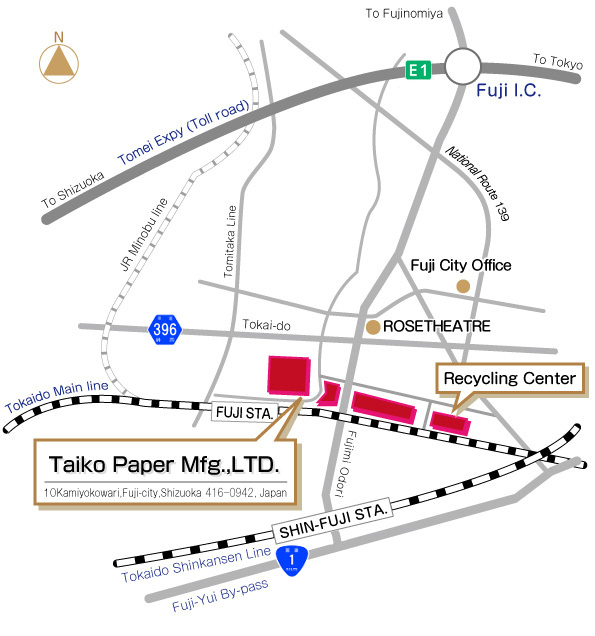 Taiko Paper Mfg. Ltd. manufactures specialty paper for industrial use with a fully-integrated production system from pulp to paper. Since our establishment in Fuji City at the foot of Mt. 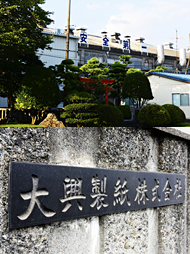 Fuji more than sixty years ago, we have produced industrial paper, concentrating on kraft paper for agricultural produce bags and chemicals and packaging paper as well as such specialty paper as stainless metals interleaving paper. Our product portfolio has expanded and we now supply a variety of products ranging from functional papers for electronic parts, food packaging and paper towels. 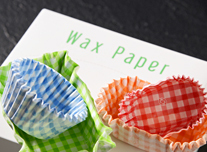 Our unbleached paper production is unique in the way that we purchase chips in Japan and manufacture kraft paper from pulp to paper in an integrated system. We have gained trust from customers in various sectors by satisfying their variety of requests and needs in a fine-tuned manner. We are determined to exert our efforts in new product development, quality improvement and stable supply to meet customers’ demands. We supply a wide range of products—paper for heavy-duty bags, paper for light packaging used for shopping bags and lamination, adhesive tape base paper for kraft tape for sealing, and unbleached kraft paper for packaging, just to list a few. 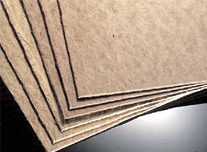 We supply machine-finish specialty paper and one-side glazed kraft paper for industrial use as well as various functional papers for household products and food. We provide pulp produced from softwood chips that can be used as enforcement materials for cardboard and building materials. Company name Taiko Paper Mfg. Ltd.
A feature of Taiko Paper Mfg. Ltd.
Taiko has independent quality control and R&D departments. The QC department carries out various tests, which include inspections in processes from chip acceptance to pulp and paper manufacture and shipping as well as various production inspections in JIS-specified constant temperature and humidity rooms. Product inspections are a combination of general tests and tests in accordance with the quality and the usage specified by customers. We supply paper that has passed these tests. The R&D department designs paper and selects pulp to satisfy customers’ requests and conducts laboratory tests and manufacturing machinery tests before production. Based on the recognition that business activity itself causes environmental impacts, we pay attention to global warming and biodiversity and work to prevent and reduce contamination. We promote efficient use of energy and resources and the 3Rs—reduce, reuse and recycle—of waste and exert efforts to ensure stable operation to lower environmental risks, with the recognition that failures in the manufacturing process have negative environmental impacts. We comply with environmental laws and regulations and other agreed-upon requirements. We set environmental targets and all employees work toward the achievement of these. We also review our management system regularly for continuous improvement. 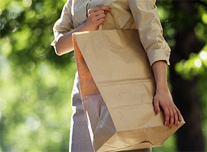 We document our environmental policy and share it with all concerned parties and the general public. We recycle wood waste into paper and thermal energy. We promote proper waste treatment and recycling (raw materials for paper production and fossil fuel substitution) as an ISO14001 certified plant and contribute to recycling society building by recycling waste using our production techniques and infrastructure for paper production to contribute to the local community. 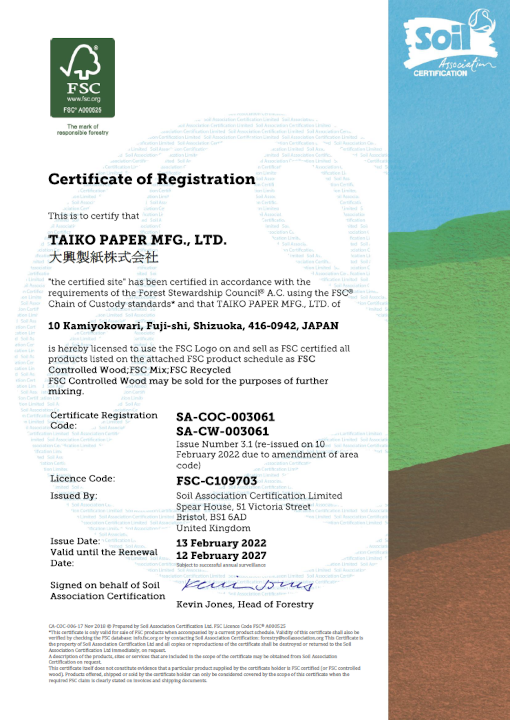 Copyright (C) 2002 - 2017 TAIKO PAPER MFG.,LTD. All Rights Reserved.